Pictured are WyFB Vice President Cole Coxbill, WyFB Director at Large Mike Whaley and WyFB President Todd Fornstrom. SHERIDAN, Wyo. 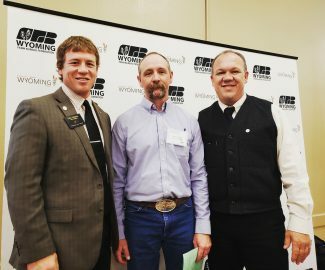 — Todd Fornstrom, of Laramie County, was elected to his third term as president of the Wyoming Farm Bureau Federation at the organization's 99th annual meeting in Sheridan. "Serving as president of the Wyoming Farm Bureau Federation is very rewarding and I appreciate the opportunity to serve," Fornstrom said. "Advocating for agriculture is something Farm Bureau members do every day and I'm honored to be counted in that group as your Wyoming Farm Bureau Federation president." 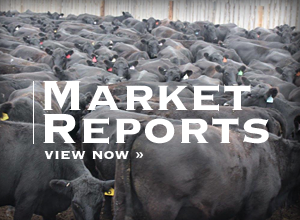 "This position has enabled me to meet a lot of people and build relationships and it is a complete blast," Fornstrom said "I am proud to serve as we move into our centennial year of representing Wyoming farmers and ranchers." Todd and his family farm in Laramie County. He and his wife, Laura, have four children. Fornstrom works with his family on the Fornstrom Farm near Pine Bluffs. The diversified farm consists of irrigated corn, wheat, alfalfa, dry beans and a cattle and sheep feedlot. They also run a trucking business, custom harvest and Todd is in a partnership and runs Premium Hay Products, an alfalfa pellet mill. Voting delegates elected Cole Coxbill, of Goshen County, to his third term as WyFB vice president. Coxbill and his wife, Sammie, have three kids. They run a trucking business, commercial spraying business and raise cattle. Coxbill began his leadership in Farm Bureau through the Wyoming Farm Bureau Young Farmer & Rancher Committee. He has also served on the board of directors for the Goshen County Farm Bureau Federation. 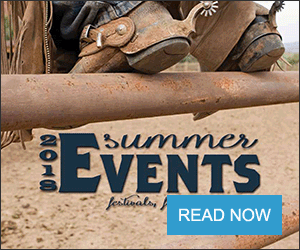 "It is an honor to serve as a leader for this organization because of the grassroots organization structure and the family focus that makes a difference for Wyoming farmers and ranchers," Coxbill said. "I've been a long-time member in Big Horn County and I would like to think I bring wisdom and experience, but I realize there is still a lot to learn," Whaley said. "I'm looking forward to serving on the board to help people through our grassroots policy development process that is the strength of Farm Bureau." In addition to the three statewide elections, five district directors and the Young Farmer & Rancher state chair serve on the state board. The Young Farmer & Rancher Committee elected Toni Swartz, of Campbell County, to her first term as the state committee chair. This position has a seat on the WyFB board of directors.